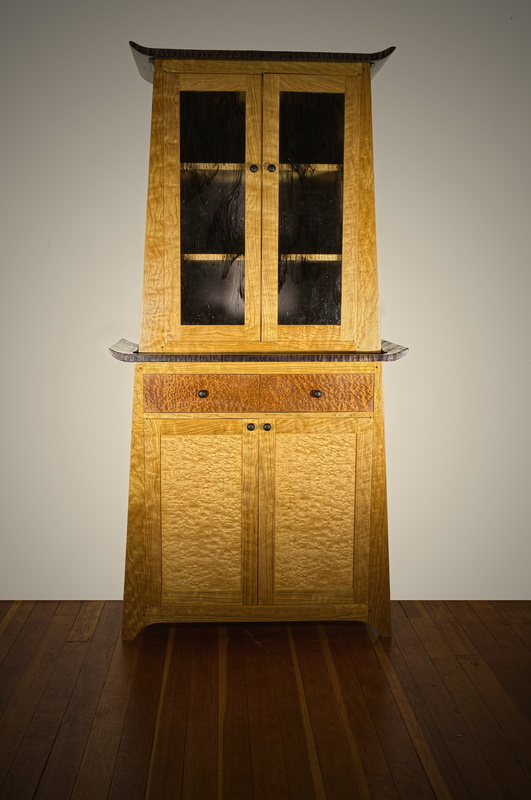 The bulk of the cabinet is built from curly cherry, the door panels are highly figured “bubbly” maple, the drawer faces are highly figured “bubbly” mahogany, and the tops of the cabinets are curly maple that has been dyed black for dramatic contrast. 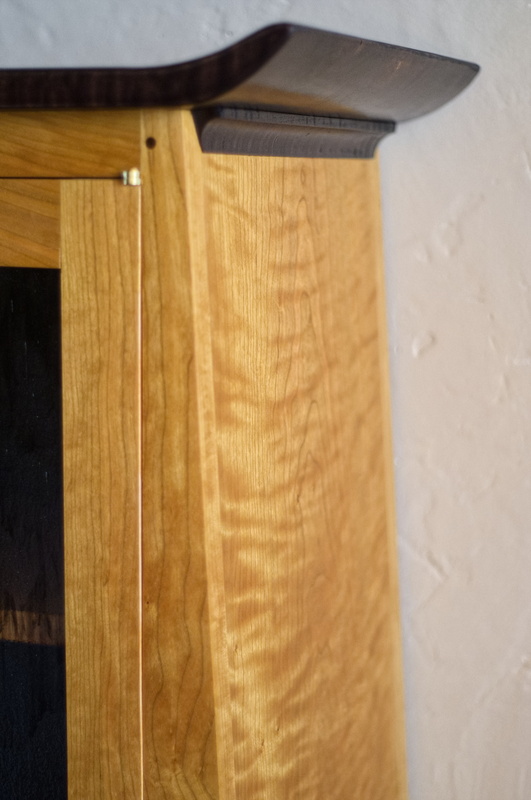 Here’s a close up of the curly cherry. 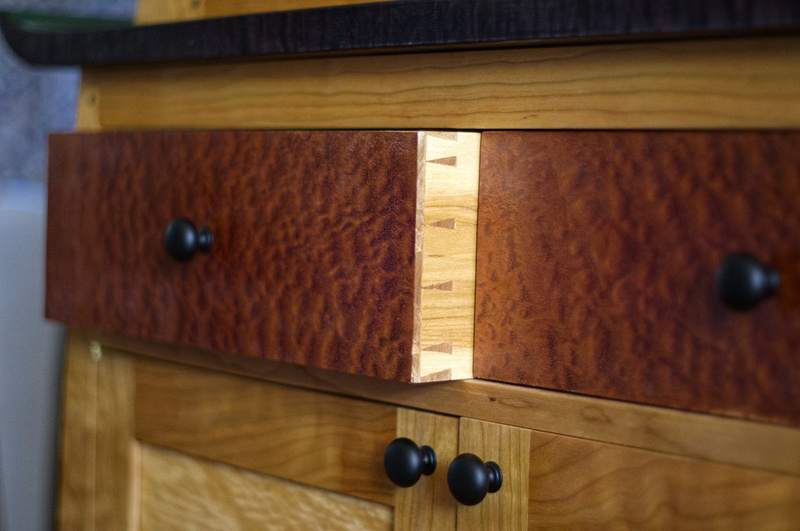 For those not in the know, cherry will age over the course of a few years to a deep reddish brown color that is almost as red as the mahogany drawer fronts. So, let’s talk about philosophy and business for a little while. 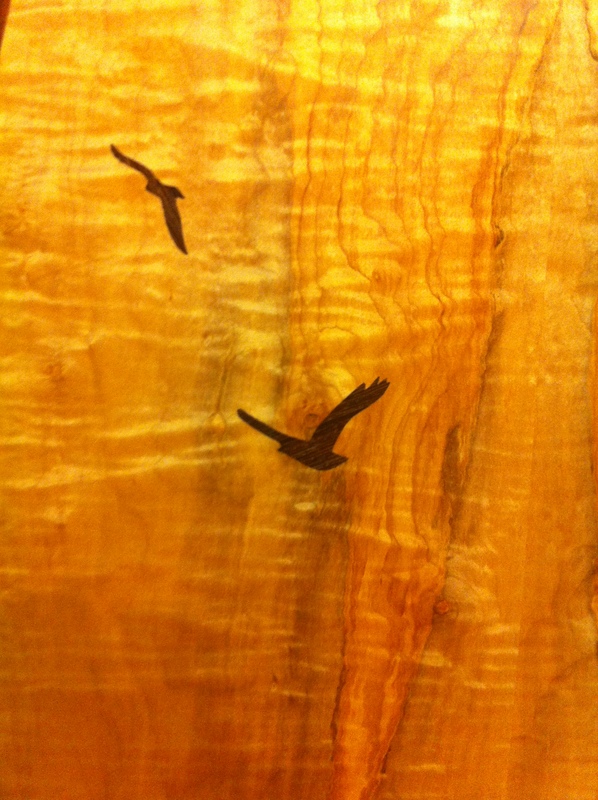 I started this business mostly on a wing and a prayer, with the belief that I can make some interesting, heirloom quality furniture, and heck, somebody might buy it. As a matter of fact, my business plan has consisted primarily of the statement “make good furniture, and somebody will buy it.” If it isn’t clear, this is work that I love to do. Of course, there is the challenge of getting my work in front of the eyeballs of potential customers. So, a fella needs a marketing plan. Word of mouth might work for a while, maybe even a long time if it’s the right folks chatting you up, but eventually you need to actively seek out customers. As for the philosophic part of the discussion, I was asked recently what my goals in life were. Believe it or not, I have thought about this, and my goals are simple and attainable. They are: make art, have fun, be good, love, and survive. This little business of mine allows me to make art, have fun, and it helps me to survive. Hello folks. Clearly I have been slacking in keeping this blog updated. Sorry about that. How about a little story about this trellis that I recently finished? The story begins with the wavy shingle pattern that you can see in the photo just above. Pretty cool huh? Well, I used to have hops strung up to the second story. (Yes, this is a personal project.) In order to install the shingles, I had to cut the hops down, and sure I could just send them back up on strings to the second story again. But, that wouldn’t be terribly fun or interesting. They needed a trellis to hold them. A trellis that would add visual interest to the house. So, I started puttering around with a few ideas, and the one that stuck was this … a big circle that would frame the window. Of course it would have to be held up off of the ground, so naturally one of the ideas to hold it up was to support it with a section of the circle. There were other ideas, but that’s the one that stuck. 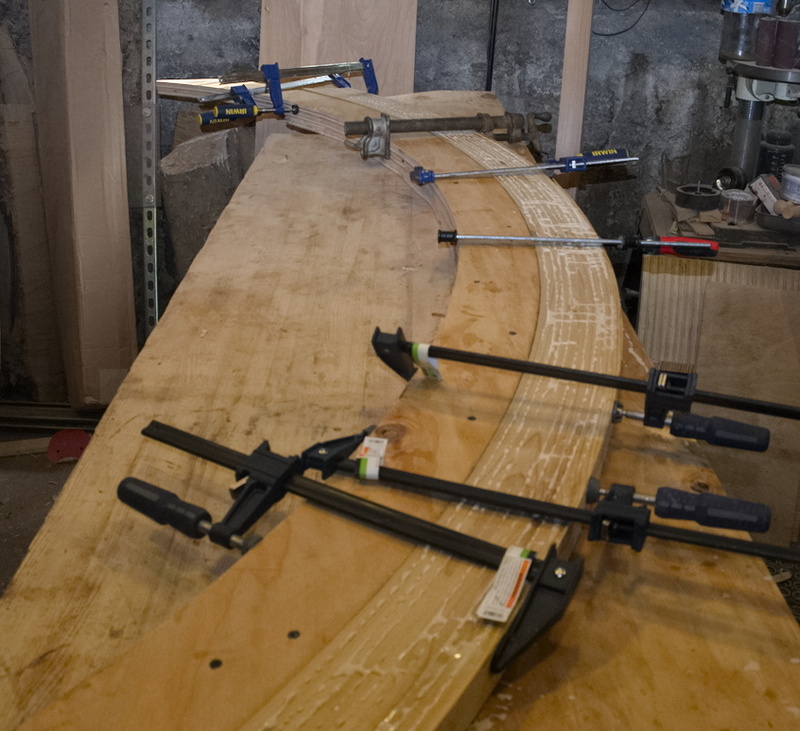 So, here’s a photo of one of the arcs during glue up. 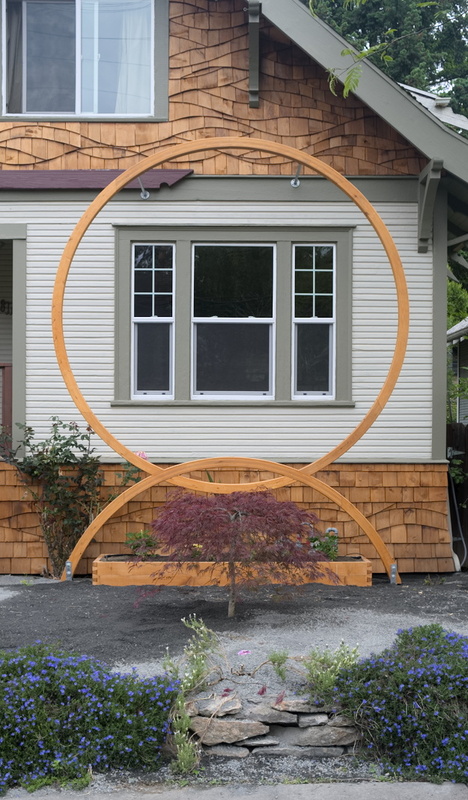 I ended up needing 10 of these arcs to complete the circle because I used 8 foot long cedar 2×6 lumber, and stacked them up to create a finished 4×4 circle. And, here you can see the circle coming together. 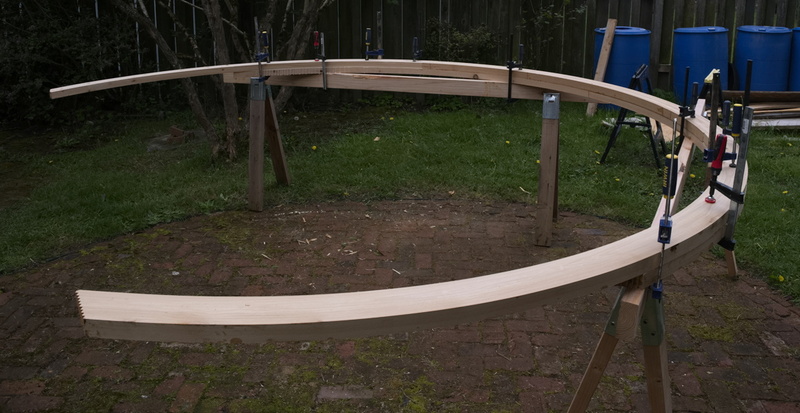 The arcs are offset, stacked, and glued together. Yep, I had to move outside to complete the construction. This thing is big! That’s about it. 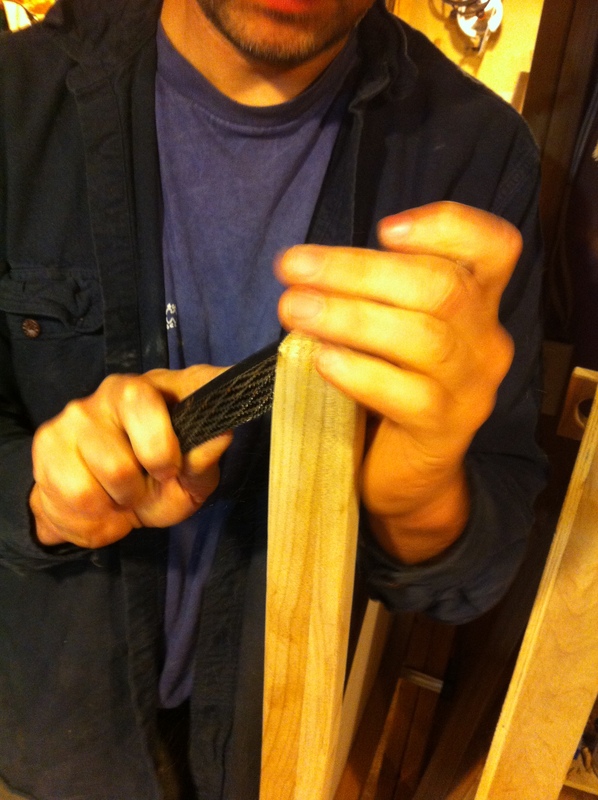 The base overlaps the main circle, and is glued on in the same manner. A little trimming, a coat of stain to match the wavy shingles, a little concrete to hold some post bases, and there you go. Now, we wait for the hops to grow. Why the Moon Door? The name was tossed out by a passing biker. I like it, my circle lets the moon in. Of course, you can call it the Big O if you must. My girlfriend makes candy for Christmas every year. She makes a lot of candy. 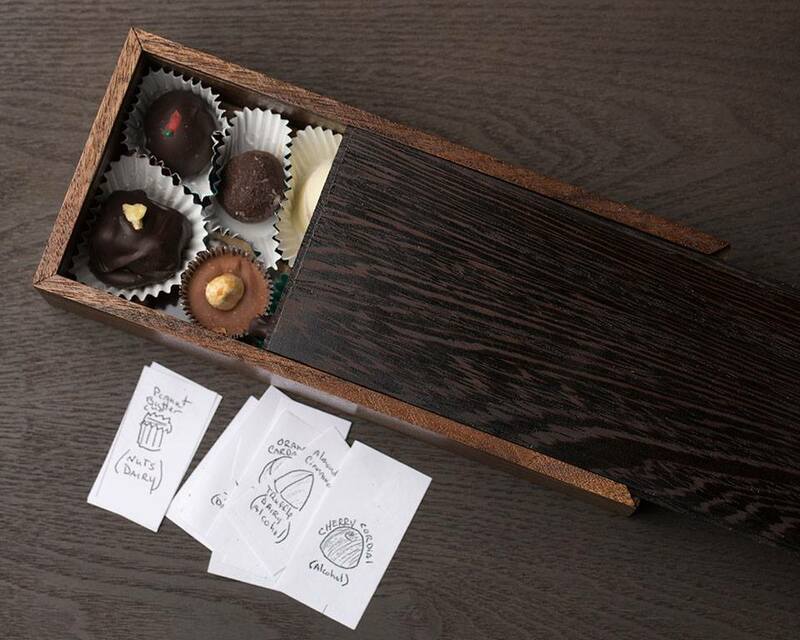 It’s a fun little gift to give to friends and family, because really, who doesn’t like chocolate? Last year, I got a little obsessed with cherry cordials. (We had some cherries that we macerated in bourbon, brandy, and almond liquor that I thought would make good cherry cordials.) Of course, the first time that we tried to make them, they didn’t turn out very good. (I have learned that cherry cordials are more than a little finicky.) But, a couple of attempts later, and we are starting to figure out the little tricks to making the little suckers. Furthermore, I had the brilliant idea to try making a rosemary ganache for rosemary truffles. 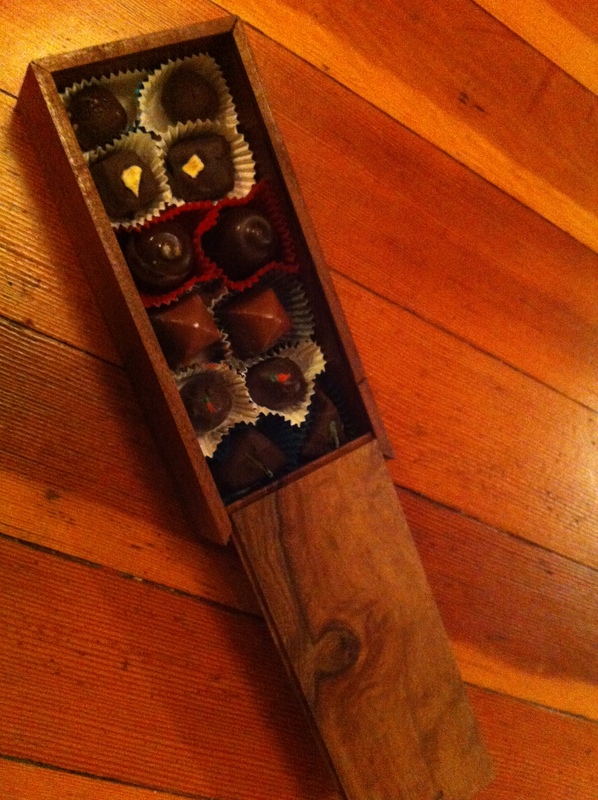 Well, one thing lead to another, and we ended up with some pretty fancy chocolates to give away this year. Of course, I wasn’t quite satisfied yet. I decided that our fancy candy should get a fancy box. So, I disappeared into the shop to mill up some scrap wood for boxes. Yep, that’s a lot of boxes. 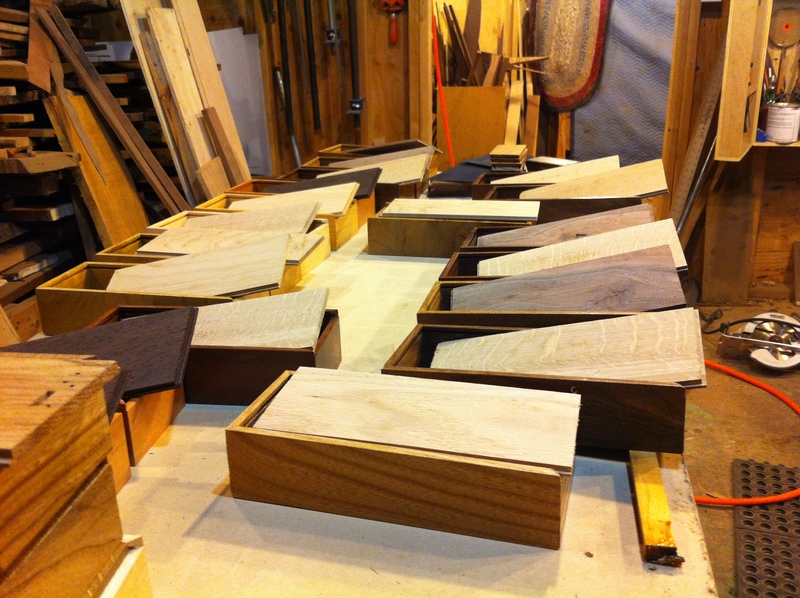 And, here they are put together waiting for lids. 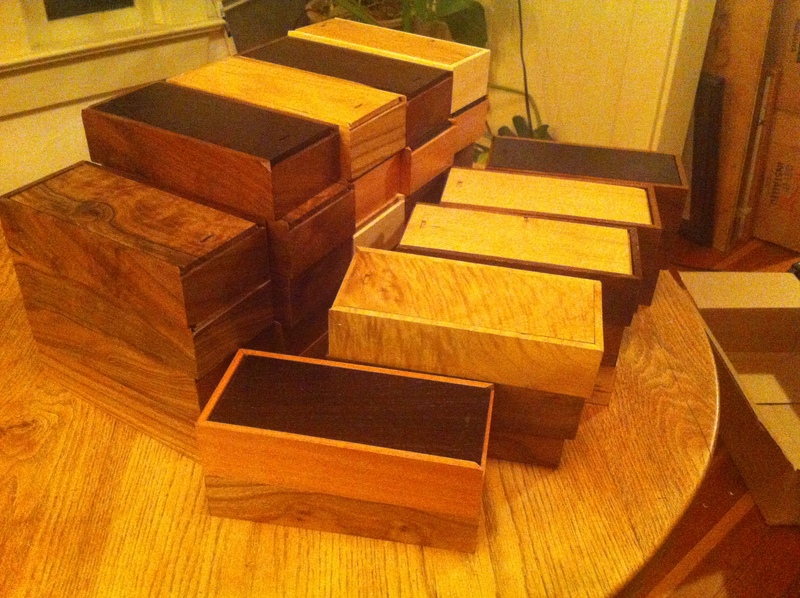 And, here’s the stack of completed boxes. And, the completed product all filled up with candy. Unfortunately, we ended up being just a bit short of the fancy boxes, so a few folks on the list will have to make do with a plain paper box. I’ll be better prepared next year. 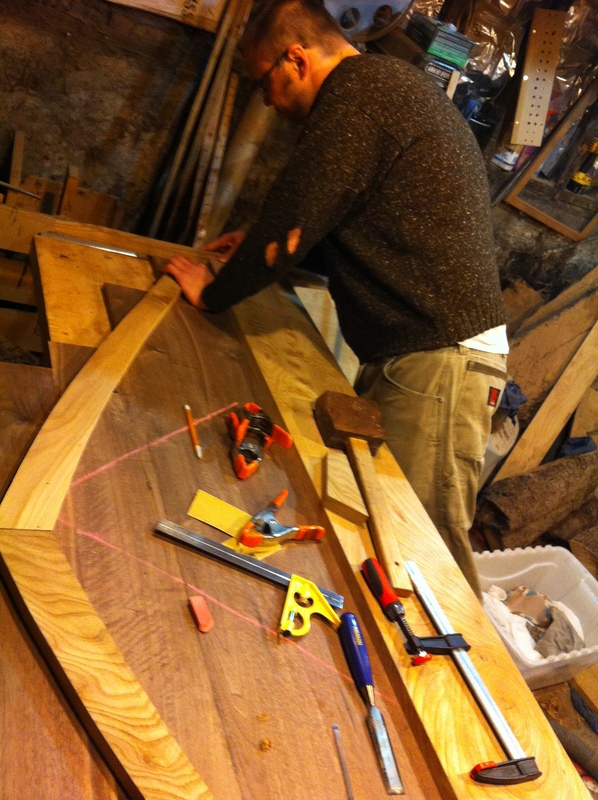 I’ve been pretty heads down for the past little bit working on a big ol’ king sized bed frame. 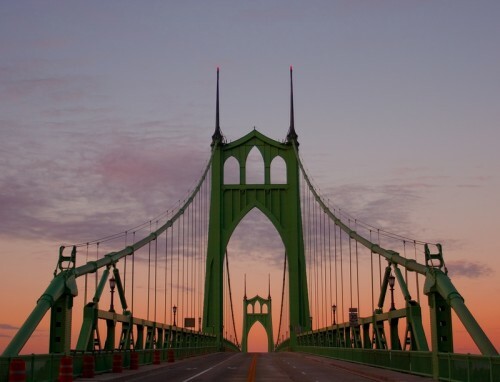 The customers are civil engineers living in North Portland, and wanted it to look something like the St John’s Bridge. For any folks reading this that don’t live in Portland, here’s a photo of the bridge taken from the deck of the bridge. It’s really a very pretty bridge. 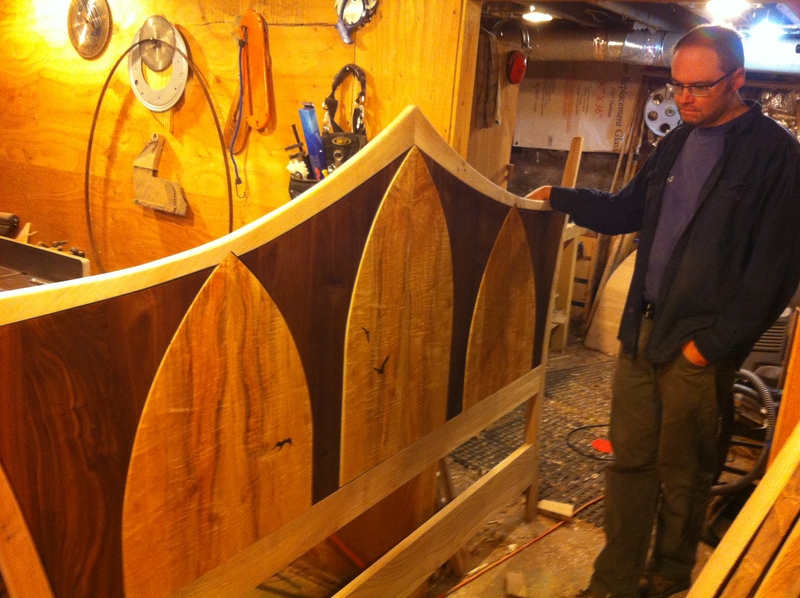 Now, I couldn’t help but to introduce a little curve here, a curve there, but we worked through a number of ideas and settled on a design for the headboard that features the three gothic arches that are so prominent at the top of the bridge’s support towers. 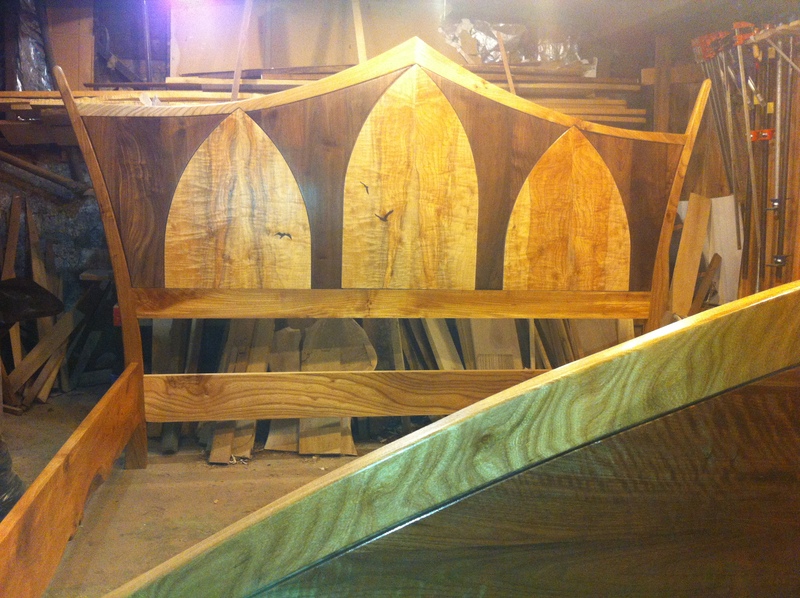 Considering that I had just enough elm that had been salvaged from the Portland Park blocks 20 years ago sitting in my shop as leftovers from another project to build the frame of this bed, and considering that the St John’s Bridge is a Portland landmark, it was a easy decision to use that elm as the basis for all of the other wood choices in the bed. 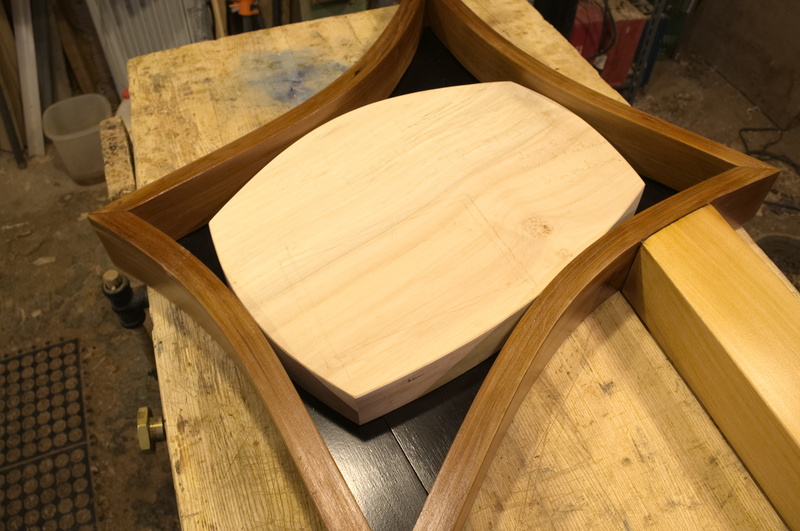 I settled on using some figured maple for panels to represent the gothic arches, and some pretty basic walnut as panels for the remaining spaces. 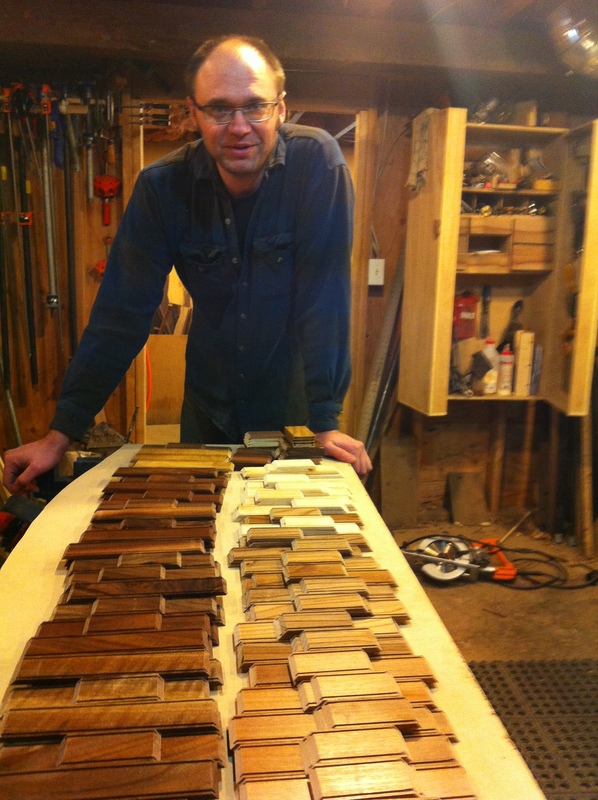 A bunch of milling, cutting, and shaping ensued, and this is what came out the other end. The footboard is much more simple. I had to do some rearranging of the shop in order to get it all put together.